The San Pedro River, which flows north from Sonora into Arizona, is internationally recognized for its high biodiversity and ecological significance. Much of the Upper San Pedro River’s riparian corridor is managed by the Bureau of Land Management (BLM)’s San Pedro Riparian National Conservation Area, yet the perennial flow supporting these reaches is threatened by groundwater withdrawals. The project site was chosen as a test case to evaluate alternative ecosystem services modeling and valuation tools for the BLM, and included an evaluation of ARIES models. Ideally ecosystem services assessments could thus inform decision making for the BLM in the San Pedro watershed and agency-wide, as well as for other federal agencies responsible for public land management. Stakeholder meetings were held to prioritize ecosystem services for analysis, inform model development, and review the output data to vet its quality for decision making. Additionally, the project compared the results generated using ARIES and the InVEST modeling system when using common input data and scenarios. Models were run for land-use change scenarios simulating urban growth, and for restoration of native sacaton grasslands. Ecosystem services modeling results for the two approaches were relatively comparable for widespread landscape change scenarios, but diverged for scenarios that represented more localized change. Bagstad, K.J., D. Semmens, R. Winthrop, D. Jaworski, and J. Larson. 2012. Ecosystem services valuation to support decisionmaking on public lands-A case study of the San Pedro River Watershed, Arizona. USGS Scientific Investigations Report 2012-5251. Bagstad, K.J., D.J. Semmens, and R. Winthrop. 2013. 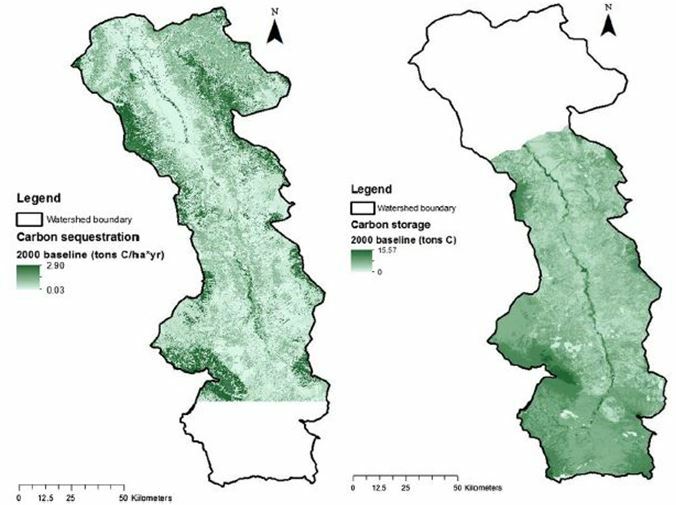 Comparing approaches to spatially explicit ecosystem service modeling: A case study from the San Pedro River, Arizona. Ecosystem Services 5: 40-50. Bagstad, K.J., D. Semmens, F. Villa, and G.W. Johnson. 2014. Quantifying and valuing ecosystem services: An application of ARIES to the San Pedro River Basin, USA. Pp. 169-192 in: Handbook on the Economics of Biodiversity and Ecosystem Services. P.A.L.D. Nunes, P. Kumar, and T. Dedeurwaerdere, eds. Edward Elgar: Cheltenham, UK. Highlights: Application of ARIES to a binational watershed of high conservation significance in an arid/semiarid region. Testing of ARIES’ applicability for ecosystem services-based decision-making for federal land management agencies.